For any of the other nine featured poetic stories, visit my poem list page. "Always let love have the right of way." A tale that one could draw much from, a yarn certainly worthy of contemplation. For it contains adventure, thrills and romance, heartbreak, treachery and tragedy. The memory of his father’s passing still fresh, the pain hardly dulled by the years. And there beside her bed sat all the evidence — assorted tablets and potions. But little consoled her, for the one that they’d lost was a much loved husband and dad. At which the more well-off residents in the neighbourhood would disdainfully stare. Just enough to get by, enough to keep the old Chevrolet going, and debts clear. And when he had the time, mowing the overgrown lawns, pruning trees and pulling weeds. Which the ridicule and distaste of all her well-off relations and family drew. But one where this young couple wouldn’t be spotted walking out that church hand in hand. And some evidence proving Gerald guilty of child molestation engineered. The girl he deeply loved appalled at him, hurt and angry, and oft seen shedding tears. And in time, the death of his shocked and disappointed mother added to his grief. A shadow of his former self, a broken man, one devoid of hope, tired and pale. And he figured that he would be the last person that anyone in town would hire. Landing in a far away country where a fresh start he hoped he would soon obtain. And again in due time, a position of authority, much power and sway. And over any pending life or death sentence, he was given authority. For it so happened that his ex-girlfriend, family and cruel accusers, came his way. And access to lawyers, (due to his accusers’ arrogance), had thus been refused. No communication allowed with the outside world, and hope beginning to fade. Knowing that each one of them were considered as having acted in collusion. Along with the possible need of his judiciousness — that is, intervention. A block comprised of several rooms, where over each window hung thick metal grills. Where one could almost feel the detainees sense of hopelessness, their deep doom and gloom. And the fact that he was about to meet his old accusers just never occurred. Their posture displaying defeat, and their long faces looking equally as grim. Gerald now a striking figure, uniformed, confident, and who anguish beheld. Now nothing but abject horror gripped those who had accused him, disowned him, and shunned. Seconds where words just wouldn’t come, couldn’t come — all frozen simultaneously. And with the silence broken, a discussion commenced, although somewhat haltingly. And given the strong denials from them all, there was little left to pursue or glean. And there was also something else that all those folk assembled very quickly learned. But he believing that a looming life sentence such a confession would compel. For his calm, confident directness and repeated innocence troubled her. And that those who were, would confess, thus bargaining on going free eventually. For he had no intention of punishing innocent members of that family. Hence why she’d turned her back on him, but now, something deep inside her began to stir. And more so, given all he’d been through, and she remembered just how hard he had fought. And Gerald was hardly unaffected too, for he knew that she’d innocently erred. And therefore, her rejection of him most understandable, and inevitable. And a family friend had been secretly jealous, her young brother had let slip. Dope just like that found in two of their suitcases in a hidden brown envelope. And thus soon began to pick up on things that she hadn’t noticed previously. And more so such a jail, thus Gerald was summoned to finally see truth prevail. And both the culprits, (a family member and family friend), elsewhere were confined. For justice and due penalty, and not vengeance, was how Gerald operated. And accommodation for the rest in a luxury hotel was soon arranged. And at no cost also, all the sights and sounds of their lush surroundings pursue. And she slowly shook her head in disbelief, her feelings shared by the others too. Yes, something only now beginning to hit home — plus, Gerald’s generosity. His request took her by surprise, and Dana seemed to fluster momentarily. She, dined within the king’s palace, and unknowingly, her future life thus beheld. And most certainly so, if Gerald had decided to act far less graciously. And all because revenge and bitterness were negatives that Gerald wisely spurned. Choices that will assist either good or evil, and are a blessing or a curse. For there are two opposing forces battling for control within the universe. “Thank you, Gerald, it has truly been a most wonderful evening,” Dana conveyed. “The pleasure is all mine,” Gerald responded, wishing that much longer she could have stayed. And to the warmth and comfort of her luxurious hotel room thus retired. And their affection and desire for each other soon noticeably much stronger. And neither Gerald nor Dana had ever felt so in love and so excited. “Will you marry me, Dana?” came the words that she had been hoping she would soon hear. There came a joyous, “Oh, yes! yes! yes!” from the lips of a glowing soon to be bride. For we rejoice seeing good triumph over evil, of which it will, ultimately. And often, via our response, good or bad, we determine certain endings that we see. Those forces we choose between, and ultimately, those right or wrong paths that we take. And currents come in many forms, things that life throws at us, certain people we greet. And plotters getting their due comeuppance when the tables turned fortuitously. But it all worked together for good, restoring noble desires and affections. And yes, Gerald and Dana did live happily ever after! I would be most appreciative of your comments regarding this poem. 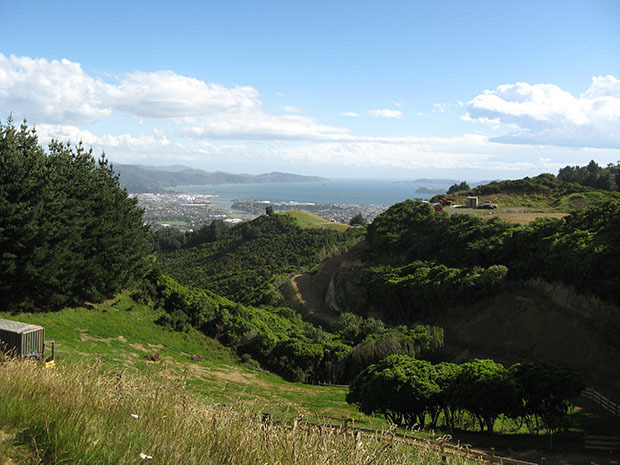 Looking across Lower Hutt to Wellington Harbour. Wellington is to the right and hidden by the hills. I’m not a person who drops off to sleep that easily, hence this poem, which I think you’ll admit was a better effort than counting sheep. However, after I had written this poem, the following biblical associations began to dawn, which I believe was the handiwork of the Holy Spirit, not me, given that they weren’t consciously designed so. Initially, it was simply a story, one that I later decided I would do in poetical form incorporating a worthy message of some sort. The reason? I thought the story was too good not to. Like Gerald, Christ felt the pain of separation from His Father. Like Gerald, Christ sought the well-being of His mother. Like Gerald, Christ left His own country (Heaven) and travelled to a faraway country (earth). Via Christ doing so, we are able to gain a fresh start like Gerald, a new life, a life with a King, and we too will be greatly favoured and showered with plenty. Gerald’s time in prison could perhaps be likened to Christ’s 40 days in the wilderness, Christ’s time in the tomb, or the trials and testing that comes to every committed Christian. Like Gerald, Christ could have blown it but didn’t. There was a Judas in Dana’s family. Like Gerald, Christ was resented, accused, rejected, sentenced, and wrongly made to suffer. Gerald’s accusers got their comeuppance. So too will those who accused Christ and saw Him hung on a cross. Like Gerald, Christ kept his dignity throughout His ordeal on earth. Gerald’s background was of humble origin. Christ’s earthy background was of humble origin. The poem also contains certain biblical elements/connections such as a rebuilding, a recovery, redemption, a new life, a kingdom, a king, and a happily ever after end (eternal life). Some have seen in this poem a likeness to the story of Joseph in Genesis. One could also see a likeness to the story of Daniel. Gerald graciously took his girlfriend back even though she had rejected him and turned her back on him. Christ forgave His wayward ancient nation and took them back, more than once. He is gracious to us too, forgiving our waywardness also when we repentantly turn back to Him. Very loosely so, Dana could be seen as the Church (bride) and Gerald as Christ (bridegroom). Can you see other associations? Please feel free to let me know in order that others might be blessed.